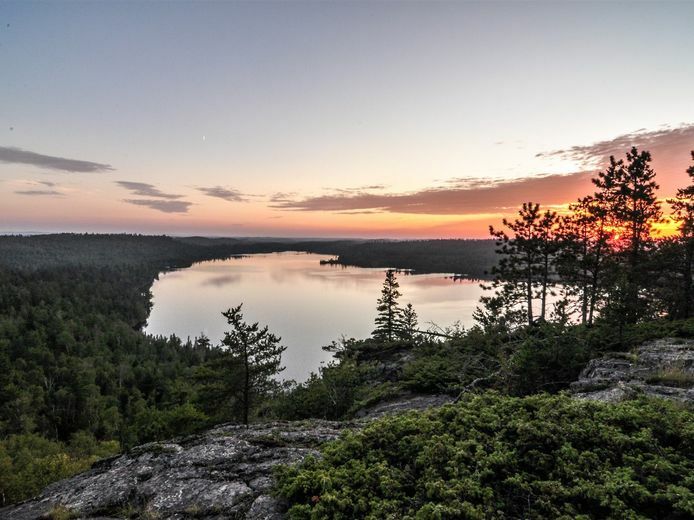 With so much to see and do on the Gunflint Trail and in the Boundary Waters Canoe Area it can be a challenge to decide where to start. Whether it is your first time or your 50th, Clearwater Canoe Outfitters can help you enjoy a day on the water. We have compiled a few of our favorite day trips and are offering them as packages. 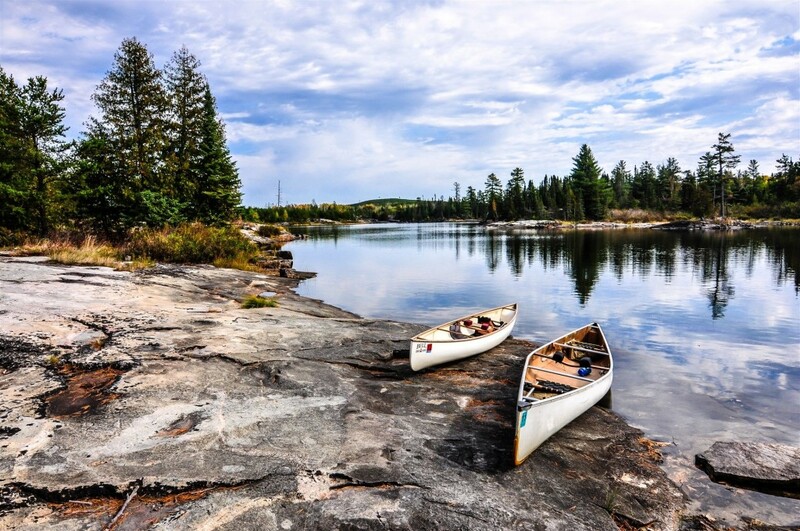 Our day trip packages include aluminum canoes, paddles, life jackets, a map and permits, a bag lunch, and a cold drink when you return to the lodge. They are listed them in order of length and difficulty with the easier trips at the top: Clearwater Palisades Trip, Rose Falls Trip, Mountain Lake Overlook. 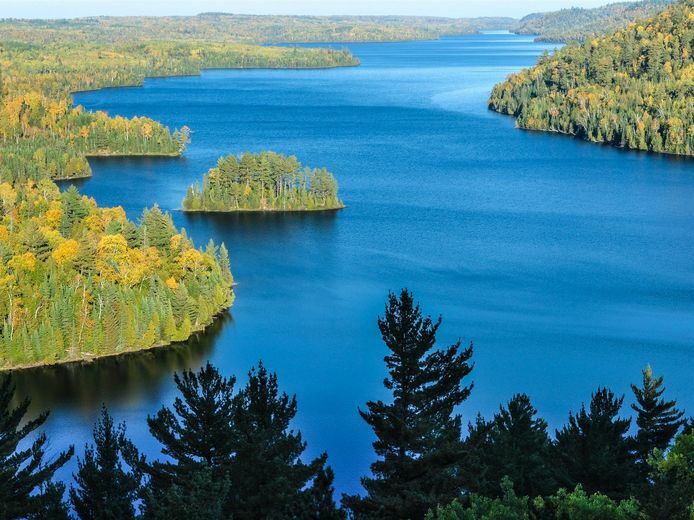 This day trip is a great option for beginners, as it offers a little bit of everything that makes the Boundary Waters a special place. 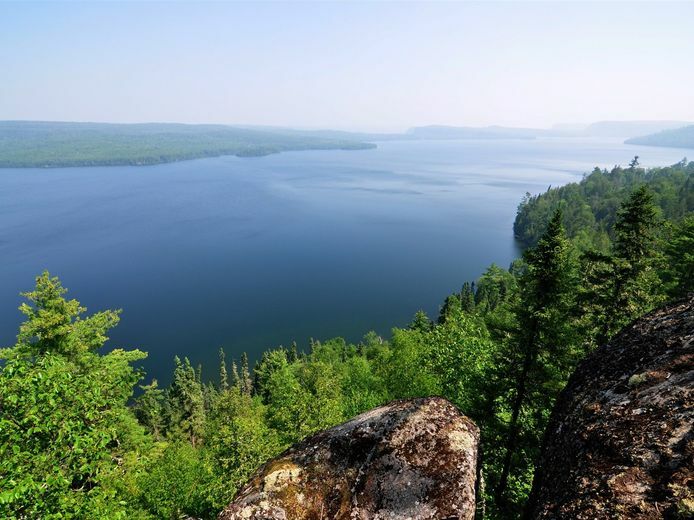 Its ease of access and stunning views makes it one of the most popular destinations on the Gunflint Trail. Standing at the edge of Clearwater Lake in front out historic lodge looking east two 400 foot towering basalt cliffs dominate the scene. A short 20 minute paddle will find you at the base of the first cliff, and at the trail that leads to the top. The trail does ascend steeply right away but then levels out for a more gradual climb and takes most people about 15 minutes. The views into Canada and back towards the lodge are worth every step. The top of the palisades is one of the first places to find blueberries in the summer. A tr ip to Rose Falls is a great option for people looking to work a little harder to visit a wilderness waterfall and climb up to some spectacular vistas of one of the most beautiful lakes in the state. This trip will give beginners a taste of paddling and portaging. From the east end of West Bearskin Lake paddle the 2 mile length of the lake and look for the portage into Duncan Lake. The 75 rod(.25 miles) portage is well traveled, easy to find and relatively flat. On the other side your route will turn you north for another mile paddle to the Stairway Portage. You can leave your canoe at the landing and walk to the falls from there. A short steep climb up the Border Route Trail to the east above the falls will lead to incredible views of untouched wilderness and Canada beyond. $25 per person ~ Includes aluminum canoes, paddles, life jackets, a map and permits, a bag lunch, and a cold drink. This day trip is for people looking to spend more time paddling on Clearwater Lake with a bit of hiking at the end and no portaging of the canoe. The view from the Border Route Trail down the length of Mountain Lake is our favorite in the area. This trip also starts from our waterfront and heads 4 miles down beautiful Clearwater Lake before turning north and landing the canoe at the portage to Mountain Lake. After leaving the canoe and hiking half way across the portage you will turn left on the Border Route Trail and hike another 3/4 of a mile. The trail climbs and drops a couple of times before climbing steeply up to the vista. The massive view down Mountain Lake and Canada is second to none.